Horrific Islamic terrorist attacks in Sri Lanka. A series of Easter Sunday bombings at luxury hotels and churches filled with christian worshippers has left at least 207 people dead. Hundreds more were wounded. Police say most of the eight bombings appear to have been suicide attacks. The government has identified religious extremists, but so far no group has claimed responsibility. Sri Lanka’s Defense Minister says police have arrested seven suspects believed to be linked to the wave of bombings. “Attacks on innocent people gathering in a place of worship or enjoying a holiday meal are affronts to the universal values and freedoms that we hold dear, and demonstrate yet again the brutal nature of radical terrorists whose sole aim is to threaten peace and security,” Pompeo said in the statement. A police spokesman said 13 suspects have been arrested in connection with the attacks. Police said they also found a vehicle they believe was used to transport the suspects into Colombo, along with a safe house used by the attackers. The explosions collapsed ceilings and blew out windows, killing worshippers and hotel guests. People were seen carrying the wounded out of blood-spattered pews. Witnesses described powerful explosions, followed by scenes of smoke, blood, broken glass, alarms going off and victims screaming in terror. At least 207 people were killed and hundreds more injured on Easter Sunday in Sri Lanka. Suicide bombers sought to kill Christians in a coordinated attack simultaneously targeting churches and luxury hotels. The explosions took place miles apart, and the targets included three Christian churches holding Easter services and three hotels. In addition to those who were killed, at least 450 were wounded, according to officials. Most, if not all of the explosions, were detonated by suicide bombers, according to the Sri Lankan Defense Ministry. 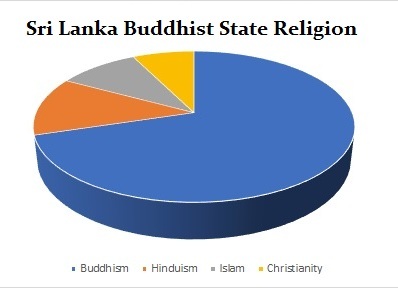 The more interesting aspect concerning this terrorist act is the fact that Sri Lanka is a Buddhist country, not Islam. The attack on Christians in a Buddhist country by Islamic terrorists raises the deep concerns that Christians will become targets anywhere and it would seem that this is perhaps deliberately trying to create a religious war. Notre Dame Central Cathedral is Lost…. A horrific historic and cultural loss. The 850 year old architectural masterpiece is a central monument to the Catholic faith. A spokesman said the entire wooden frame of the cathedral has come down, and the vault of the edifice could be threatened too. ‘Everything is burning, nothing will remain from the frame,’ Notre Dame spokesman Andre Finot told French media. The 12th-century cathedral is home to incalculable works of art and is one of the world’s most famous tourist attractions. Pictures showed enormous plumes of smoke billowing into the city’s skyline and flames engulfing large sections of the historic building as firefighters struggled to contain the inferno. According to French newspaper Le Monde, the fire broke out in the attic of the monument before spreading across the roof. Officials in Paris said the fire could be linked to restoration works as the peak of the church is currently undergoing a 6 million-euro ($6.8 million) renovation project. Beware of Shari law its Coming to a Neighborhood Near You! Mar 30 2019 | by Bill WarnerThis a wide ranging interview by a host from Ireland. We cover how political Islam works and how we must answer the most basic questions first. The Somalian pirates have once again sailed into North American waters. But instead of kidnapping coastal dwellers for slavery or taking bounty to enhance their wealth, from the 16th century onwards (and again in the 2000s), they are here to continue the process of taking land, America from Americans for Islam and Israel from the Jews for the self-proclaimed “Palestinians.” For centuries, the legacy of Muhammad’s raids has been the acquisition of land and booty/wealth (Maal-e-Ghanimat), gizya (extortion/tax) from the conquered people, and modern-day welfare, such as the annual £25,000 ($33,009) received by Islamic preacher Anjem Choudary in Britain, who urges other “jihad seekers” do the same. Salafi scholar Abu Ishak al Huweini lamented, “If only we can conduct a jihadist invasion at least once a year or, if possible, twice or three times, then many people on Earth would become Muslim.” He added that if they could not confiscate the wealth, they would kill the men and kidnap and enslave their women and children. American cleric Anwar al-Awlaki instructed that the disbelievers’ property is never rightfully theirs, and may be forcefully “retaken” for Islam, a belief system that supports the Islamic right to anything they want – Europe, America, and Israel, home to the Jews for more than 3,000 years. Islamists continue to disregard the Jewish kingdoms, sovereign Jewish state, and continuous Jewish presence in the land, Biblically documented and archaeologically verified. It was therefore not surprising, except to those who failed to notice the sharia-compliant hijab and oath of office sworn to Allah on the Qur’an, that Somalian-born Ilhan Omar (D-MN) can so boldly deny Israel’s historic and legal rights to exist. And if she can make headway in Congress while also undermining the American government and people’s inalienable rights, so much the better. Her recent proposal, bound to be superseded by yet another jab before this goes to print, was, “We must acknowledge that [Israel] is also the historical homeland of Palestinians.” That is not the case. There is absolutely no evidence of a Palestinian history before 1967 AD! Those who assumed this false identity were the Egyptian, Iraqi, Lebanese, Jordanian and Syrian squatters who went in search of work in the flourishing Israel and who were ill-advised to vacate the land by the invading Arab armies, expecting to return after the Jews were annihilated. They were to be disappointed. Weakened and isolated as pawns in Gaza, Judea and Samaria, they began an unceasing political, psychological, and propagandist war of conquest in the court of world opinion. While such attempts at land acquisition may differ from country to country – from Africa, India and the Middle East, to Europe, Australasia and America – let us not delude ourselves into thinking they’ve suddenly amended their 1400-year-old ideology. They have not. The Four Stages of Islamic conquest have been delineated, and it might be prudent to take a moment to review them now, as each stage reveals the clear pattern of their strategy. The list unmistakably shows that we Americans are deeply entrenched in Stage #2, identified as the Consolidation of Power, including, for our purposes here, revisionist efforts to Islamize history – with a foothold into Stage #3. Ilhan Omar has been dedicated to criticizing Israel and attempting to inspire compassion for Palestinians who, she suggests, are suffering the same “inhumanity and suffering” seen in the Somalian civil war. Certainly not, as those “unspeakable horrors” are Muslim against Muslim. Palestinians have eschewed peace, consistently rebuffing Israel’s every offer of permanent peace, even when they were offered 97% of the land they wanted. Rather, they bind their children in explosives, teach their children to hurl missiles and incendiary balloons, and wield a sword for beheading, instead of engaging in life, liberty, and the pursuit of happiness enjoyed by Israelis. Palestinian suffering is self-imposed. Islam is responsible for 34,751 terrorist attacks since 9/11, and 25 attacks (149 killed) in 12 countries during one week in March, 2019 alone. There is not a shred of evidence that Palestinians could live peacefully next to Israel, since their children are immersed and engaged in jihad beginning with their toddlerhood. Omar further rued, “Without a state, the Palestinian people live in a state of permanent refugeehood and displacement,” yet it is their own brethren and leadership who placed and kept them in refugee status for Western sympathy, they who have refused statehood and peace, they who continue to wage war against Israel, they who sorely mistreat even their own, particularly girls and women. They show no sign of interest in reverting to democracy where even their own people might live harmoniously. The threat against regional peace comes from those who carry out the will of Allah and Mohammed, as well as from the diminutive, ungracious and hostile Omar, who thinks nothing of denigrating the President of the one country that granted her refuge and comfort, America. And so we have Stage #3: Open War with Leadership and Culture, which reflects on the combined efforts of Islamists and the left. Intentional efforts to undermine the host government and culture. Academia continues Islamic teaching/antisemitism, removing our history, students whitewashed. Government positions infiltrated; oath-taking changes; deliberate acts to change our system of representation, to pack the supreme court, to encourage alien invasion to ensure an election outcome; to demoralize our president’s efforts to keep the country safe; to destroy our energy independence; to increase taxation and restrictions against companies and individuals. Work to disarm and diminish our population, by birth control, deteriorating healthcare, and euthanasia. Acts of barbarity to intimidate citizens and foster fear and submission. Conservatives shut down and attacked for political differences, MAGA hats; physical attacks against Jews. Violence to property – stores, historic monuments, burning cars. Open and covert efforts to cause economic collapse of the society. School personnel and Muslim Student Associations (MSA) engaged in boycotts against Israel; working to increase taxes and regulations; the economically devastating Green New Deal. Flooding our nation with dependent non-productive aliens; continued socialized medicine. All opposition is challenged and either eradicated or silenced. The FBI’s manuals purged of all Islamic references, thwarting police forces; information withheld by the media; visiting speakers denied on campuses; Islamic tea party outreaches to convince their religions are alike. Rejection and defiance of host society secular laws or culture. Pockets of Muslim residents ruled by shari’a; demanding food and prayer accommodations to shari’a. Destruction of churches, synagogues and other non-Muslim institutions. Desecration of synagogues and churches; defilement of cemetery headstones. Historic monuments toppled. Women are restricted further in accordance with Shari’a law. Muslim patrol cars now evident on the streets in some cities, to ensure that shari’a is followed, including women’s dress. Stage #3 also includes removing influential personalities from the media (Glenn Beck, Judge Jeanine Pirro). Islamic militias formed for widespread ethnic cleansing; large groups of able-bodied men assembled in any of the more than 2,000 mosques, of which 80% (1700) are known to be preaching hate and violence against Jews, serving as jihadist recruitment and training centers – and as armories. Also listed are large-scale population destruction, assassinations, bombings; usurpation of government’s political power, imposition of shari’a, mass execution of Muslim intellectuals who do not support Islamization. Later generations will not thank us for letting the fire take hold. A crazed Senegalese migrant kidnapped a bus loaded with 51 middle-school-aged students near Milan Italy. The suspect attempted to burn the bus with the students inside, but fortunately police were able to rescue the children as the fire started. One of the children was able to hide their cell phone and call for help. An alarming story and rescue that was caught on video by a passing motorist. (Via Daily Mail) A Senegalese man abducted 51 children when he hijacked an Italian school bus and set the vehicle alight in a protest over migrant deaths in the Mediterranean. Ousseynou Sy, originally Senegalese but with Italian citizenship, stopped the bus he was driving, with two classes of high school students on board. He was said to have ordered the children’s hands to be bound and threatened to kill them and himself during the drive, before setting the vehicle on fire when he was stopped by a police blockade today. Officers broke the glass in the back door of the bus and got all the passengers to safety without serious injury before the flames destroyed the vehicle, authorities said. Muslims lie not because they are liars by nature but by choice. Systematic lying as a religious policy is deadly, and if our politicians do not understand this, thousands could die. – Don Boys, Ph.D. The mission of the jihadi/jihada (one who engages in holy “war with non-Muslims to establish the religion”) is to bring Islamic law, sharia, to the world, whether through peaceful or violent means, and Ilhan Omar has dutifully begun her vocation for Allah, who is described in the Quran as the greatest deceiver of them all. It goes on to say that ALL deception belongs completely to Allah, that Allah actually raises wicked individuals to deceive and scheme, and commands people to do evil so that he may then have reason to destroy them – for Islamic supremacy. Mohammed led by example when he broke promises and treaties with three Jewish tribes, Banu Qaynuqa (624), Banu Nadir (625) and Banu Qurayza (627), and subsequently beheaded all the men, captured and enslaved the women and children, and enriched himself and his troops with the towns’ bounties. We must therefore recognize that Omar is mandated by religious doctrine to emulate Mohammed’s deception, using any means possible against her victims to advance the Islamic ideology. “When hate crimes against [her] and [her] followers don’t exist, they have to be invented,” to deflect attention from the jihadi onto the Muslims as victims. Since her installation as a member of Congress, Omar has repeatedly censured Israel and Israeli and American Jews, making antisemitism acceptable and freely spoken by the re-awakening antisemitic community. Her allegations are a stealth technique of projection, as when the subject attributes his own unpleasant traits, impulses or ideas to another. For instance, Omar accuses Israelis of “abuse against women,” “apartheid” and “occupation,” distinctly Muslim deeds. She accuses Jews of dual loyalty to Israel, but not people of, say, the Palestinian territories, Somalia, Iran, Central and South America, who might donate their earnings to provide financial assistance to their homelands. Lest we forget, these three Muslim lands are known supporters of terrorism, whereas Israel is known to be the only democratic country in the Middle East, one of America’s most steadfast allies, and one that provides services that benefit people throughout the world – and this is the one she denigrates and boycotts. There can be no other valid reason except the centuries-nurtured visceral hate. Ilhan Omar’s hostility is clearly defined by Islamic law as against Judaism, a religion that follows the Torah and Commandments for morality over evil. When Mohammed’s new religion was rejected by Jews and Christians for such pagan superstitions as circling the Ka’bah, and for its violent proselytizing, to name just two reasons, he turned their prayer direction to Mecca and against those who rebuked him, slaughtering thousands and seizing their treasure. It is this resentment that was instilled into Mohammed’s followers. They are removed from every aspect of individual freedom and bound to carry his millstone of hate and envy. And here is the tactic. While Omar attempts to delegitimize the Jewish community’s allegiance to America, and her coreligionists work to delegitimize the Jewish bond to Israel (even to destroying holy relics dating back 3,000 years), she hides her own history and failings, that she will never assimilate, is not to be trusted, and will work to delegitimize our Constitution with sharia. “Ultimately we [Muslims] can never be fully citizens of this country…because there is no way we can be fully committed to the institutions and ideologies of this country.” – Ihsan Bagby, leader of CAIR-KY, president of its board and Islamic Studies professor at the University of Kentucky, 1991. “If we are practicing Muslims, we are above the law of the land.” – Mustafa Carroll, executive director of the Dallas-Fort Worth CAIR branch, 2013. Islam’s blame/shame culture is why this jihada will never admit to and apologize for her actions. Omar scarcely walks back her numerous canards when she immediately restates her free speech prerogatives to criticize Israel’s policies, using old antisemitic myths about Jews and money, as though Islam’s oil wealth has had no influence on our western banking, the media, our lower grades and universities, and indeed the entire United Nations. Her vague apologies have never actually acknowledged her wrongdoing or responsibility, and she would obviously run a repeat performance. She has also used the infamous Muslim Brotherhood maneuver, inserting the shrewd, devious warning that she must never be condemned “for being Muslim,” the Islamophobic threat intended to intimidate any who would contest her word. She is not naïve. Highly adept in her cunning, she is guilty of a fervent allegiance to Islam that supersedes any loyalty to America and, regrettably, she appears to have completely hoodwinked the inexcusably credulous Nancy Pelosi. In the late 18th century, the Muslim Ambassador Adja explained that the Quran gives Muslims the right and duty to make war against all, make slaves of prisoners, and that every Musselman who is slain in battle was sure to go to Paradise. The Wahhabi-type Muslim radicals, named for the Barbary Pirates from the Barbary Coast of North Africa, waged terrorist attacks through two decades. After a four-year war, a treaty was signed to end the aggression in 1805. Yesterday’s Islamic Barbary pirates are today’s Islamic Somalian pirates from the same region, with the same pronouncements of jihad against the West. It now includes those who participate in “large scale mass migrations [that] become invasions,” known as hijrah. It overtook the Middle East, is prevalent through much of Europe, and is with us now, which is why the Arab countries refuse to take in their own refugees. Aided by the Left, the goal is to overtax the economy, tear down the wealthiest nations, redraw demographics and culture, and secure positions where they can work to overturn our civility and government. Ilhan Omar, a Somalian Muslim, took her oath of office on the Quran, as did Rashida Tlaib, the “Palestinian” who wrapped herself in the Palestinian flag. In so doing, they pledged their allegiance not to the United States of America, but to Allah. Additionally, Omar is suspected of having ties to the radical Muslim Brotherhood (MB), and herein lies the projection connection. While she accuses Jews of duplicity, we must always reinterpret what the devotee of Islam says, particularly one who has been a keynote speaker for the IRUSA (Islamic Relief USA), the largest, global, Muslim fundraising group with terrorist ties, and CAIR (Council of American Islamic Relations), listed as an unindicted co-conspirator in the largest terrorist fundraising operation in US history. As MB affiliates, these women seem to be working to support subversive factions aligned to destroy America and Western civilization. And while it was unexpected to hear her recent criticism of President Obama, considering his affection for Islam, and for other “flawed” presidents, Omar may be promoting herself and the new Progressives as the real “hope and change.” It may have been an unguarded moment when she expressed disdain for everything American, or perhaps she hopes to prepare the directionless youth, who’ve been deprived of their identity, religion, history, and reason, to submit to governance by another – Allah. The APPG (All Party Parliamentary Group) some members of the UK Parliament who have issued a document that defines Islamophobia. Their goal is to make “Islamophobia” a crime. Islam is defined as whatever Muslims want it to be. The APPG claims free speech will not be affected as long as the speaker in question does not cause harm. “Harm” is defined as anything that offends a Muslim, even if it is a fact. Although the document is only a committee report, many British city councils are implementing the report as law. This is totalitarianism. This is Islam.